Born and raised in Colorado Springs, Erin began her training with Rozanne David at The Dance Center of Colorado Springs, and continued her training with Zamuel Ballet School under German and Valentina Zamuel. She then attended Texas Christian University’s School for Classical and Contemporary Dance and graduated with a Bachelor of Fine Arts in Ballet and minor in General Business. While at TCU, Erin performed soloist and principal roles in ballets such as Le Corsaire, Bournonville’s Napoli, Giselle, George Balanchine’s Valse-Fantaisie, and Four Temperaments staged by Michele Gifford. 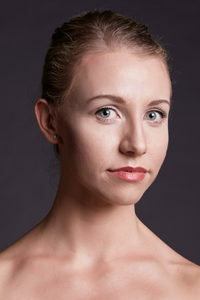 Erin joined Eugene Ballet as an Aspirant in 2016 and has performed roles such as Prudenza in Pulcinella, as well as Princess Wei Lo and Harlequinade in The Nutcracker. Erin was also featured in Stephanie Martinez’s Wandering On, and also in Val Caniparoli’s Tutto Eccetto il Lavandino. This is Erin’s first season as a company member with Eugene Ballet.